PROF ANESH MANIRAJ SINGH has a long history as an academic, having obtained BA, MBA and DBA degrees from the University of Durban-Westville. Since 1999, he has been in the employ of the university; a period of 19 years. In that time, he has worked his way up the ladder from a temporary lecturer through several academic roles and leadership positions at the University of KwaZulu-Natal (UKZN). These are interim head of Information Systems and Technology, Deans Assistant - Research, Head of the Graduate School of Business, and dean and head of the School of Accounting, Economics and Finance. One of the highlights of his career was leading the Graduate School of Business to be recognised as the Top Brand in KwaZulu-Natal in 2011. 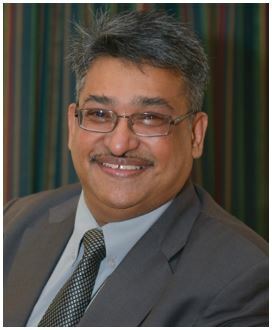 In addition, he has served as an executive member of the IT Standards Generating Body of SA and served on the Education Portfolio of the Computer Society of South Africa - KZN Chapter. He was also the national vice president of marketing of the Computer Society of South Africa in 2005 and 2006. Prof Singh has also served on several national and international committees related to his areas of interest in education. He has presented at many conferences and his research has been published in journals both locally and internationally. When the position of executive director of the UKZN Foundation became vacant, he was asked to take on the role, as there was a leadership void. This was a position of responsibility that Prof Singh was happy to accept, and he was appointed as the executive director of the Foundation in 2016. He commented, "I felt that I would be able to do a lot more for the university than from a position of a single school but rather from one that looks at the total university and finding solutions for all the students. UKZN inspires greatness and that in terms of the university is what inspires me to do more and more to ensure that we can inspire greatness amongst our students." The UKZN Foundation is the official fundraising arm of the institution. "The primary function of the Foundation is to provide an efficient and effective fund-raising service that benefits all its stakeholders, including students, academics, stakeholders, society and the various strategic projects of UKZN," said Prof Singh. He added, "I work with a team of eleven people who are every dedicated to ensuring that we raise funding for the university and its initiatives." The funding is directed towards teaching and learning support, research support down to student funding, which includes bursaries, disability and food security. "I have been successful because I am now at a point in my life where I can give back, I am successful because I can make a difference in other people's lives." Of importance is that the UKZN Foundation strives to cultivate a strong relationship with donors, which typically consists of trusts, corporates, high net worth individuals, alumni and the general public. In an annual survey on higher education, it was reported that the University of KwaZulu-Natal excelled at community engagement. Said Prof Singh, "Maintaining these relationships is essential to driving the UKZN Foundation's fundraising programme." He said further, "It does not matter, the size of the donation − big or small. Prof Singh said that late father made a strong impression on his life by two maxims: "be true to yourself" and "hard work does not kill you". These are maxims which he put sin to practice daily. He says that his role is about building relationships as these firstly open doors, afterwards you need to get to know people and earn their trust. "I try to maximise my time out of the office and it is very important that I spend more than 50% of this out of the office. Donors are not sitting at the university, they are out in industry and I have to be where they are. UKZN needs the support of the corporate community to engage more effectively and to invest in the city, the province of KZN and ultimately the country." He concluded, "My motto is very similar to Nike but quite different: don't talk about it- just do it." In his free time Prof Singh is a Hindi movie fan and he also enjoys cooking and watching cricket.